The Boston Red Sox won their second First Division title in 2017, setting the record for the largest winning margin in the games behind column. The San Francisco Giants and Texas Rangers fell to the bottom. New to the First Division in 2017, the Boston Red Sox cruised to the title by five games on their partner in promotion, the Cleveland Indians. The First Division title normally is a pretty tight affair, but the Red Sox ended the campaign with the largest margin in the history of this competition. The Red Sox won the inagural First Division in 2010 by four games on the Philadelphia Phillies and the Tampa Bay Rays claimed the 2011 top tier title by the same margin over the San Francisco Giants in the two previous largest margins. The 2010 title was Boston's only previous First Division championship. The Giants and Texas Rangers fell to the bottom of the First Division in 2017 and are headed to the Second Division in 2018. Coming up from the Second Division to the First Division are the Arizona Diamondbacks and the New York Yankees. The Diamondbacks will be in the First Division for the first time in their history. The Yankees were an original First Division team in 2010 but finished last in the tier in 2013 to be demoted and are headed back to the top level for the first time since then. 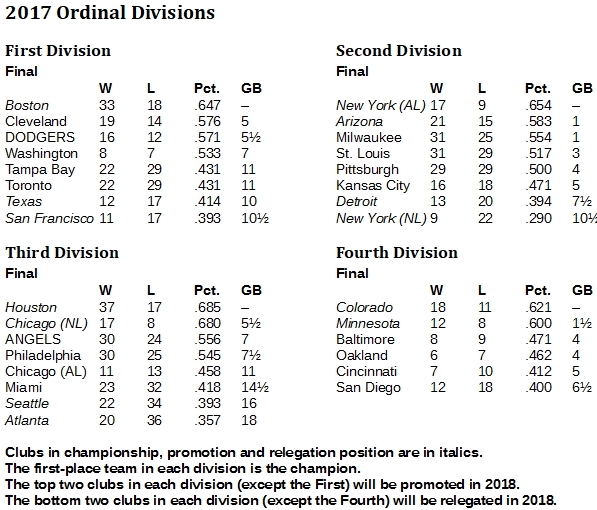 The Yankees won the Second Division in 2017 by one game over the Diamondbacks and the Milwaukee Brewers, who missed the second promotional spot by percentage points. The Detroit Tigers and New York Mets both won promotion to the Second Division for 2017, but both found the soup a little too thick at the higher level and they're both going back to the Third Division in 2018. In their place are the last two World Champions, the Chicago Cubs (2016) and the Houston Astros (2017), the top two Third Division clubs of 2017. The fight to stave off relegation to the Fourth Division came down to two losers and one survivor, with the Miami Marlins coming out of it in the preferred position. The Seattle Mariners and Atlanta Braves are going down to the Third Division in 2018. The Colorado Rockies and Minnesota Twins, easily the best two Fourth Division teams in 2017, are going up to the Third Division in 2018.